Many retailers are working to create a distinct in-store experience — but in today’s digitized world, most of the retailers are fusing digital and physical shopping to create a cohesive store experience for their visitors. 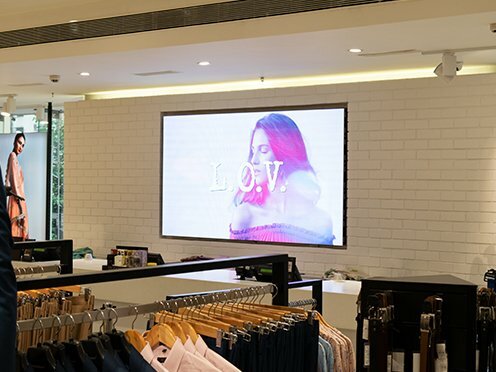 One of the many ways retailers have tried to bring in digital experience into brick and mortar is through digital displays like digital signage, LED Displays, transparent LED Displays, interactive wayfinding and much more. 8/10 visitors have entered a store because of a digital display catching their eye. Hence, there is no denying that digital displays grab the attention of your visitors and help you promote your brand efficiently. How to use digital displays for your brand? Digital Signage can be used to promote sales or special product features to entice customers to walk into the store. Engaging videos and images are more likely to catch eyes and draw them in. Overall, visitors will have a higher brand perception and awareness through digital signage. Digital signage uses can extend to instore benefits too. For retailers, digital signage management, scheduling content and even changing the content is as easy as a click of a button. For people using cloud technology, they don’t have to worry about physically changing the content as everything can be controlled centrally. Digital signage saves overall cost and time. An LED is a digital display technology every retailer wants in their store. They can be used to display uninterrupted images and videos of almost any shape and size to grab shoppers’ attention and drive footfalls into the store. The brightness of the LED makes it effective to captivate visitors indoors as well as outdoors. Their availability in resolutions makes it all the more perfect as it can be customised as per the retailers’ convenience. Finally, because they are modular, if something goes wrong you need to replace only one modules rather than the entire display. Stereotypical shop displays with mannequins and props are being replaced with transparent LED displays. These displays leave no doubt in building brand image and creating more footfalls as they are the point of sale displays. The boring shop displays are now being transformed into bright displays with eye catchy videos and images playing on them. Shoppers today have an urgency to quickly locate their shops and reach their destination in the least possible time. Interactive wayfinding is most suitable when it comes to this situation. Interactive wayfinding shows the fastest route to the visitors’ destination. Along with showing the fastest route, interactive wayfinding also plays brand videos and images when idle. This solution also has inbuilt feedback system. Any visitor can give their feedback on a particular brand. This solution is ideal for mall owners to help visitors reach their destination without any hassle and for brand owners to promote their brand and get a feedback too. Retailers can bring in technology to make the store experience more appealing and indispensable, but to create a good experience, retailers also need to have deep knowledge about their visitors. Knowing the customers mean understanding their interests, preferences, attention span and in-store movement too. All these details can be fetched easily through one software called the crowd analytics. Crowd analytics helps to trigger the gender, viewing span, age and the total number of people viewing the content. Through this software they can easily customise what kind of content they want to show their visitors which will keep them interested. This will drive more attention of the visitors, which will eventually lead to increased footfall and revenue. Bringing digital displays into your store, opens up a world full of possibilities for promoting your brand and products, serving customers and enhancing store experience. However, you decide to use them, digital displays can be a big difference for your brand and customers - and that’s worth investing in!